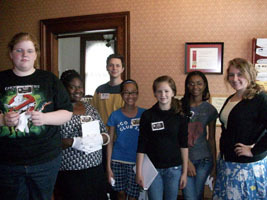 Newly trained "Junior Docents" will help as tour leaders at the Oberlin Heritage Center on Thursday, July 30 during the 1:30 p.m. tour, which begins at the Monroe House (73 1/2 South Professor Street). These teens recently completed a one-week docent training summer camp, and they will awe you with their knowledge and enthusiasm for Oberlin History. This would be a great time to bring your school-aged children for a tour -- what fun they'll have learning from their peers! Admission is $6 per adult; free to children and to OHC members. For more information, or to make a reservation, call (440) 774-1700 or e-mail tourinfo@oberlinheritage.org.